ShopBuddy is a simple shopping list application designed to manage all of your shopping needs. 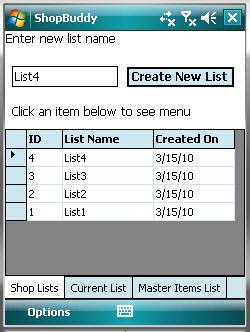 You can create unlimited number of lists and maintain your master list of items which you buy frequently. The master list is a one time setup and can be used to populate your lists. You can sort your master list by items names or categories etc. This app could be used for any kind of lists which you could think of. If are heading to a grocery store, going for camping, travel etc, this app can be used.